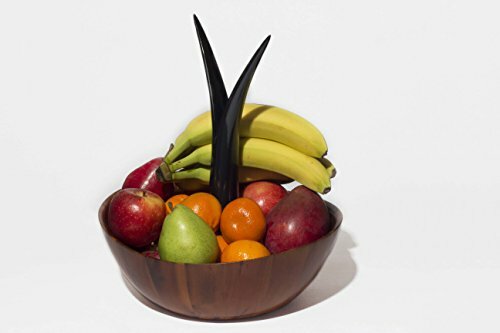 Acacia Fruit Bowl with Bananna Hanger. 12 x 5in. The Casa Bellante serve ware collection offers style and color to compliment your table or home decor. Acacia wood offers a distinctive grain which is natural looking yet lightweight and durable. Due to natural variations in wood grain, no two bowls are exactly alike. Each product is 100Percent FDA approved and finished a food-safe lacquer to give a durable yet elegant finish. This product is entirely hand crafted by skillful artisans and craftsmen to ensure quality and a truly unique piece. Manufacturer: Vision Home Products, Inc. Publisher: Vision Home Products, Inc. Studio: Vision Home Products, Inc. If you have any questions about this product by Casa Bellante, contact us by completing and submitting the form below. If you are looking for a specif part number, please include it with your message.